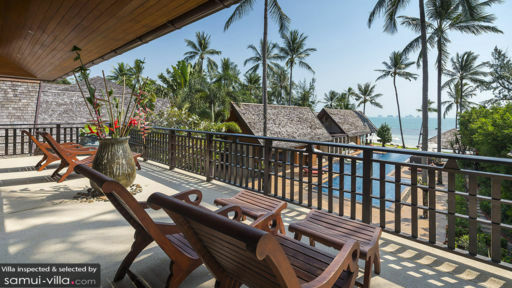 Baan Puri is a luxurious holiday rental located close to Lipa Noi beach in Koh Samui, which makes it possible for guests to stroll along the sandy shores of the beach without a hassle. Beachside dining and lounging is possible, and so is enjoying laps in your free-size swimming pool! The villa is located in a quiet corner of the world, where there are hardly any tourists so you might as well have the beach to yourself. Plenty of outdoor spaces for enjoying the warm tropical weather are accessible alongside equally opulent and modern amenities found indoors. With six bedrooms housed either beachside, upstairs attached to a balcony, or adjacent to the pool area, Baan Puri is perfect for hosting a private event. An outdoor staircase leads to the two bedrooms upstairs that share a balcony with sprawling views across the ocean. Five of the bedrooms are furnished with king beds while the sixth has twin beds, suited for children. Some of the bedrooms are housed in individual pavilions, offering privacy and exclusive rights to the garden etc. The bedrooms are well-furnished with ottomans at the foot of the beds, dressing areas, and air-conditioners. The en-suite bathrooms are equally opulent with splendid freestanding bathtubs and/or shower areas apart from other amenities. 29 x 6 x 1.25-1.70m, with shallow zone for kids. Manicured gardens that as if one body with the sandy beach outdoors are magnificent to the naked eye, especially since the ocean dazzles under the tropical sun. The free-size swimming pool is where you can relax and truly let go of all your worries, simply swimming and splashing about. Lounge on the sun chairs found on the deck or the built-in sunbeds for some hydrotherapy! There is a dining pavilion and sala right beside the beach, for the ultimate beachside dining experience with the sound of the waves crashing against the shore and a serene ambiance that you won’t find anywhere in the city. 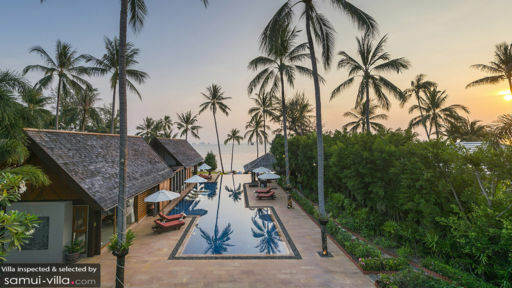 Baan Puri has been designed with traditional Thai architecture taking precedence over modern structures, hence, there are distinct pavilions housing the living and dining spaces, bedrooms, and other lounging areas. High-vaulted ceilings and other wooden interiors accentuate the Thai heritage of this beautiful space. The living room is just off the swimming pool featuring glass doors and walls for an unending and unobstructed view of the scenery outdoors. Furnished with plush sofas, wooden flooring etc. the living area is perfect for an evening with friends and family. There is a 42” TV and Sonos sound-system fitted indoors as well as around the garden and pool for the perfect party mood or even to listen to calming tunes while relaxing. The indoor dining is part of the living area with a 14-seater dining table stood in the centre of the room. A fully-equipped kitchen is accessible to guests, fitted with world-class amenities and other useful appliances. With a wonderful staff to look after you during your stay, your stay will be memorable and their services will make you keep coming back for more! Housekeeping, chef service, and personal guest assistance is offered to guests along with a complimentary breakfast each morning. Car rentals and in-house massages can also be arranged upon request! Serenely tucked away on the beach, Baan Puri offers direct access to the coastline so you can sunbathe on the beach, and swim in the waters. For a calm and quiet ambiance, this is the perfect place as you have this entire beach to yourself! A beach club you can head to for a change of scene would be the nearby Nikki Beach Samui. This was our third visit and once again the villa did not disappoint. This place is wonderful! Peaceful, relaxing, just gorgeous. The food was again amazing! Khun Aoy is such a delight, running a very professional team. Can't wait to go again! The Baan Puri villas provided us with a wonderful experience. We enjoyed a quiet week of fine dining at the villas, mixed with daytime swims and massages. I would recommend these villas to those looking for a 'special' place with 'special' service. The staff in particular are exceptional. Many reviews cover what can be expected but not until you stay here will you really understand the excellence of staying here. Stayed with friends and all I can say is you get 5* star service with intimacy of being the only guests. There were six of us in total staying with five staff in attendance. Nothing was too much to ask and Khun Aoy will deal with your every needs. The food was amazing, be it breakfast, lunch or dinner. So good I am looking at arranging trip back next year for a longer stay. I celebrated my 50th for a week at Baan Puri with a group of 12 friends - mostly couples. The accommodation was excellent, the view brilliant and the staff were most helpful, friendly and made our week all the more enjoyable. Our villa manager Aoy was terrific. Fantastic Thai food for breakfast, lunch & dinner. Relaxing and fun. Great poolside bar ... All Good Aoy also helped organise transport for trips to various spots around the island. Each morning we would plan the menu for lunch & dinner and settle $ the following day. Very good value - about $20AUD PP / PDay. Best to appoint a treasurer for your group so Aoy only has to deal with one person. We will be back in 2 years to do it all again . Great venue for a gang of friends or a family get together. I knew the setting was going to be idyllic, having seen the photos and read the TA reviews, however I was not expecting the veil of calm that descends as soon as you walk through the scented Buddha Garden before reaching the main house. From that moment onwards you don't want to leave! This is an exceptionally well-run villa with a team of professional staff under the wonderful Manager, Khun Aoy, who ensures your stay is a memorable one. The accommodation is clean and spacious, the infinity pool is enormous, you are surrounded by beautifully tendered grounds but I have to make a special mention about the Thai cuisine prepared by the Villa's dedicated chef. The menu is extensive and it was the best Thai food I've ever tasted (and I live in Asia!). Baan Puri is a very special place. I stayed here in April/May 2014 with 6 friends, and had the most relaxing time ever. If you want to go out and enjoy the sights and sounds of Samui, the villa staff can arrange a car for you and give you advise on what is available and when. I, on the other hand, simply stayed at the villa and wallowed in the luxury that is Baan Puri! When booking, you get the whole villa, whether it's for one room or 6... It's great with friends, but I can imagine very romantic as a couple. There is space for everyone to find their own little "quiet spots", and do what they want, while the noisier group can still have fun without disturbing others. The villa comes with excellent staff, including a chef who is there to make you pretty much what you want. The villa manager will suggest menus for you. All you have to do is choose, and eat. All ingredients are bought fresh on the day... I can' wait to go back, and infact have already booked the next trip! Samui's best kept secret! Myself, my wife and some friends have just returned from Koh Samui where we stayed in the Baan Puri Villa, the holiday was fantastic, we had an amazing time. The villa is spectacular, there is a real ‘wow’ factor when we arrived, it’s perfect for a few friends to get away and have some fun together. It has an amazing pool and is right on the beach which is one of the best I have seen anywhere is Asia. There were seven of us but the villa can easily take 10 to 12 in luxury accommodation. The staff were superb, we did not have to lift a finger and they seemed to know what we wanted before we asked!!! The villa is a short hop from the airport and there is plenty to do close by including a fantastic local golf course and local town with many bars, restaurants, spas, etc. I recommend hiring a boat for half a day, get picked up on the villa's beach, go island hopping and end up in a local beach front restaurant. 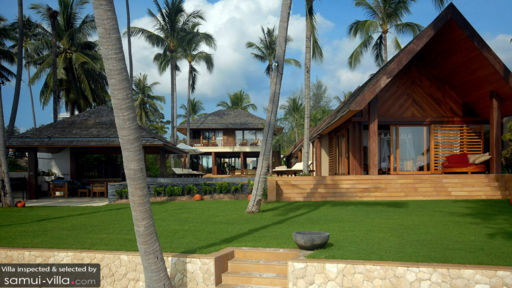 There are a few luxury beach villas in this area but this one is definitely the best, if you fancy Koh Samui, come here! Had my son's wedding in baan puri. What a memorable celebration. The staff in the villa were awesome. Nothing could go wrong n lots of surprises. Aoy, the villa manageress was the best of the best. She made sure we werent bored with our food n dining presentation. 10 out of 10 with staff services, food n cleanliness etc. Couldnt find a fault on this property. White sandy beach, raked n cleaned every morning by Toon, the maintenance boy. The infinity pool was awesomely awesome. The whole team worked hard n always happy to help when theres any problems. Chef was unbelievable. The whole villa was amazing. Was sad to leave after a week but all has to come to an end. Totally recommended n we will definitely be back. Best of the best in everything. Everything was so perfect, would recommend this place to anyone who is thinking of having the greatest holiday or any ocassions. When we arrived in baan puri, we didnt believe what we saw as sometimes when we book accomodation on internet, it can be a totally different thing when you get there. As for baan puri, what you see in their photo gallery is what you get, and all reviews are very true in whatever they wrote. Not only was the accomodation amazing, but the staffs there are the nicest people who will do anything for you with a smile. Aoy, who is in charge of the villa is the nicest and could do and organise anything that we wanted. She will go her way out to get whatever you want for you with a smile. The villa chef, Peng is the best chef ever as well, she will cook anything you want if you rather have your meals in the villa than outside. Then there are the other staffs like the maintenance guy, Tun who normally organises the settings of table, pool towels etc. There are also two more staffs (i think) who cleans our rooms daily and who also helps with other things, and there are always surprises on our bed. Aoy gets along with all her staffs so well and that what makes tbe place a magical place. As for the beach, its so private, clear water and warm. The sand is always clean as its only a small beach and Tun cleans the beach every morning as well. There is also a night security person whose name is Den, and he is lovely too. My nephew had his wedding at the villa, and omg, its so so unreal. Everything was so well organised by the wedding planner, it was like in the movies, a wedding on the sand and photos with the sunset. I cant even fault anything staying in baan puri and its the best. Its about 45 mins drive from chaweng and lipa noi is a very quiet place, and the closest town is nathon, 10 mins drive away. You can get everything there. I would recommend anyone to baan puri whether for a holiday or thinking of celebrating an ocassion. Beautuful villa in peaceful surrounding - ideal for a relaxing escape with friends or family. Beach-side location with huge pool and great views. Fantastic service from Khun Oy and her team - great food and endless cocktails at the pool bar! Highly recommended.